In North Carolina, the nearly 100 Mecklenburg Medical Group physicians who have decided to break away from local health system Atrium Health name their new multispecialty physician practice Tryon Medical Partners. After a somewhat contentious legal process, Atrium decided to release the physicians from their non-compete agreements so they can begin practicing independently September 1. TMP plans to start seeing patients at between five and 10 locations just after Labor Day. Its placeholder-like website gives no clues as to what health IT systems the group will use once it opens for business. Glenwood Systems adds GlaceOffice, a collection of administrative, security, and auditing software, to its GlacePremium EHR, PM, and RCM platform. Physician’s Computer Company adds online payment capabilities to its patient portal. Family Health Care Clinic implements TruMed’s AccuVax Vaccine Management System across its facilities in Alabama, Louisiana, and Mississippi. 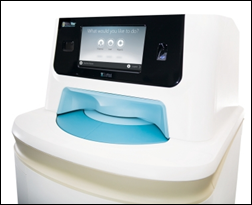 Modernizing Medicine company GMed adds mobile capabilities to its EHR for gastroenterologists. The company will rebrand to Modernizing Medicine Gastroenterology later this year. Physician-led practice management, consulting, and RCM company Vituity opens an additional office in Leawood, KS and hires 65 staffers. The California-based company rebranded from CEP America in January, bringing its MedAmerica and MedAmerica Billing Services subsidiaries under one umbrella. Good News Clinics (GA) embarks on a campaign to raise $1 million that will enable it to connect to North Georgia Health System’s Epic software. 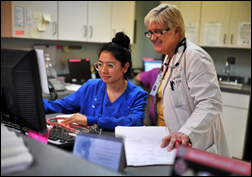 The free clinic, whose volunteer physicians use Epic at their other healthcare sites, will transition from Practice Fusion and a separate LIS. Adam Feldman (Qualifacts) joins DrCloudEHR vendor EnSoftek as SVP of business development. Payspan names Kernie Brashier (CaptureRx) CTO. OCHIN hires Josh Lemieux (Intel) as VP of development and foundation engagement. Stratus Video adds remote language interpretation capabilities to its telemedicine video conferencing system. Seattle-based telemedicine company 98point6 expands its chat-based service area to include Texas. 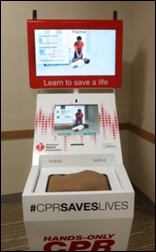 Hennepin County Medical Center (MN) installs a self-teaching CPR training kiosk in an effort to help people become more comfortable and confident when performing hands-only CPR. The Whack-a-Mole-like kiosk is the state’s first, and dovetails nicely with its effort to ensure that all public high school students become certified in the technique. InstaMed’s latest payment trends report finds that 65 percent of patients would consider switching physicians for one that offers better payment options. Seventy percent admit to being confused by their medical bills, which is probably why 80 percent wait three weeks before paying them. Nordic reports that its score of 98.1 on KLAS’s “HIT Assessment & Strategic Planning 2018” report is the highest of all companies mentioned.